mmsonline.com October 2017 MMS 83 FEATURE successfully. Essentially, this involves under- standing the condition of the part in all the regions where we plan to cut precision features, taking into account planned stock allowance as well as unplanned part distortion. We are seeking an alignment of the part that leaves enough mate- rial in all of these locations to allow consistent and effective cutting. Once again, we can use probing to achieve this. 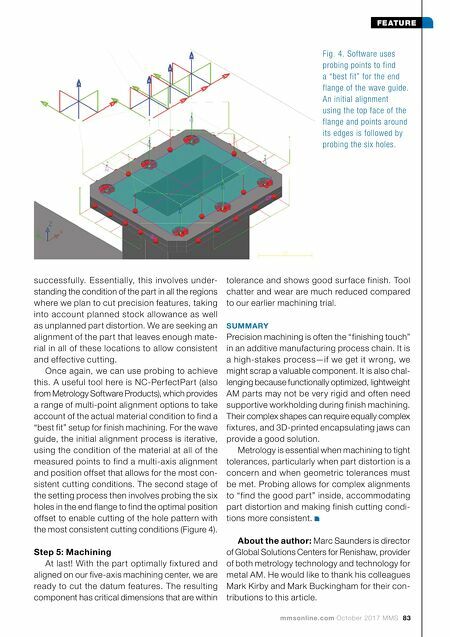 A useful tool here is NC-PerfectPart (also from Metrology Software Products), which provides a range of multi-point alignment options to take account of the actual material condition to find a "best fit" setup for finish machining. For the wave guide, the initial alignment process is iterative, using the condition of the material at all of the measured points to find a multi-axis alignment and position offset that allows for the most con- sistent cutting conditions. The second stage of the setting process then involves probing the six holes in the end flange to find the optimal position offset to enable cutting of the hole pattern with the most consistent cutting conditions (Figure 4). Step 5: Machining At last! With the part optimally fixtured and aligned on our five-axis machining center, we are ready to cut the datum features. The resulting component has critical dimensions that are within Fig. 4. Software uses probing points to find a "best fit" for the end flange of the wave guide. An initial alignment using the top face of the flange and points around its edges is followed by probing the six holes. tolerance and shows good surface finish. Tool chatter and wear are much reduced compared to our earlier machining trial. SUMMARY Precision machining is often the "finishing touch" in an additive manufacturing process chain. It is a high-stakes process—if we get it wrong, we might scrap a valuable component. It is also chal- lenging because functionally optimized, lightweight AM parts may not be very rigid and often need supportive workholding during finish machining. Their complex shapes can require equally complex fixtures, and 3D-printed encapsulating jaws can provide a good solution. 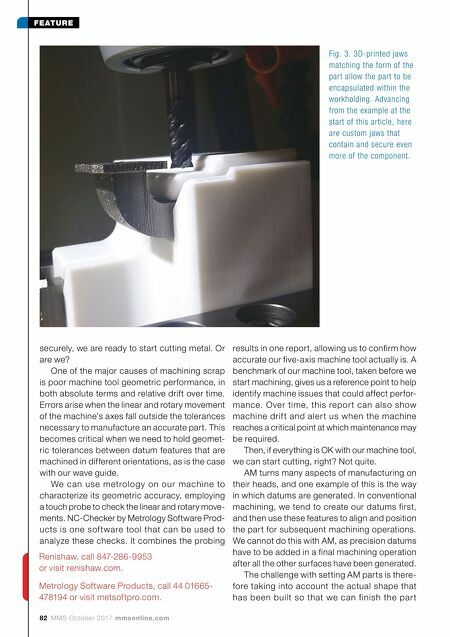 Metrology is essential when machining to tight tolerances, particularly when part distortion is a concern and when geometric tolerances must be met. Probing allows for complex alignments to "find the good part" inside, accommodating part distortion and making finish cutting condi- tions more consistent. About the author: Marc Saunders is director of Global Solutions Centers for Renishaw, provider of both metrology technology and technology for metal AM. He would like to thank his colleagues Mark Kirby and Mark Buckingham for their con- tributions to this article.